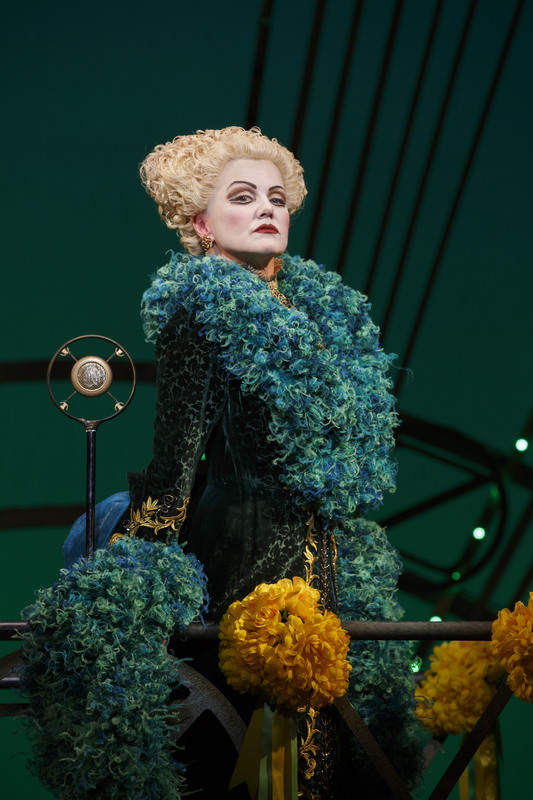 In anticipation of the return of “Wicked” to the Bay Area this week, Alison Fraser, playing Madame Morrible, sat down to answer questions via email about the show, her character and the importance of “Wicked” in today’s American theatre. The two-time Tony Award nominee joins Emma Hunton as Elphaba, Chandra Lee Schwartz as Glinda, Etai BenShlomo as Boq (who played the role during the open-ended run in San Francisco) and former Saturday Night Live regular Tim Kazurinsky as the Wizard. “Wicked” opens Wednesday, Aug. 27th. DJC: You have had amazing success as a stage actor. What is it about the opportunity to tour with “Wicked” that was so appealing to you at this point in your career? AF: In almost 40 years of professional acting, I had somehow never toured. When I looked at the “Wicked” schedule, I saw that it was going to cities I would probably never visit otherwise-places like Cincinnati and Salt Lake City and Nashville – and I thought exploring those cities could be a great boon to the touring experience. Who knew I would love Tulsa or Omaha? It’s a wonderful country out there, and how lucky I have been to be able to see it firsthand. 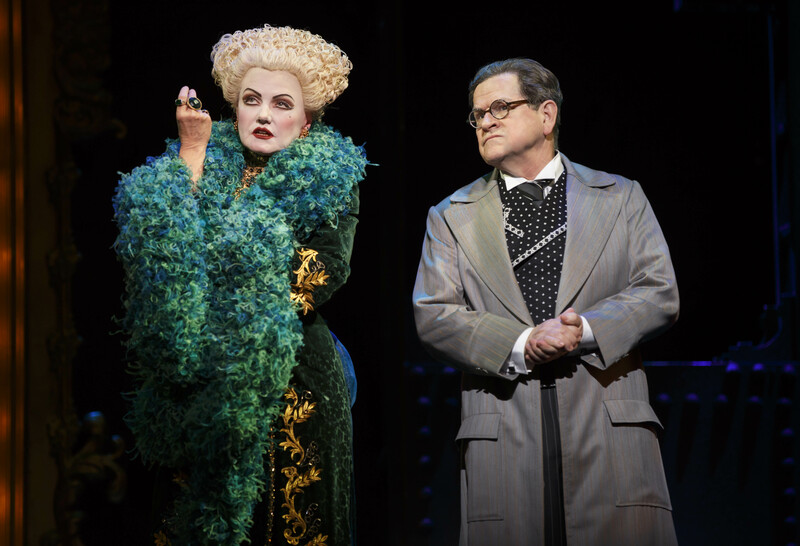 DJC: What is the funnest thing for you about playing a not-so-nice character such as Madame Morrible? AF: I have played many villains, including the hell-on-wheels diva Veronica Bailey in the award winning web series “It Could Be Worse,” and the Teutonic fanatical hit woman Sister Maria Walburga in Charles Busch’s hit comedy “The Divine Sister.” For me the most intriguing aspect of playing a villain (and I do believe that the only unequivocally villainous character in “Wicked” is Morrible) is to find out the motives for whatever heinous acts she perpetrates in the piece. Villains think of themselves as the hero of their own story. The fun part is discovering what that story is. Why does Morrible lie, spread evil gossip, manipulate, and ultimately kill? Because she wants to be in a position of absolute power in Oz, and feels strongly that she deserves it. She is definitely the second smartest person in the play, and she has hit a glass ceiling in her career in education. It is time to move on to bigger things, and whatever it takes to get them is justified in her mind. I tend to think of her as the Cheney to The Wizard’s Bush, and that, of course, is a very entertaining thing to play. DJC: What was your first experience with Wicked? When did it become apparent to you that you would have a future with such an iconic show? AF: I saw “Wicked” when it first opened ten years ago, and enjoyed it very much. I am a big Stephen Schwartz fan from way back, and Winnie Holzman’s book is just about perfect. There’s not an extra syllable in it, yet the sparseness tells an epic tale. I never saw myself as a Madame Morrible, but I was called in to audition for the part around five years ago and I found that I liked the scenes, and thought perhaps I could approach it in a different way. I didn’t get it, and I thought, Ah well, that’s show biz. But lo and behold, about ten months ago I got the offer without going in to audition again. So it just goes to show, don’t beat yourself up because you didn’t get the job. Maybe you were good but not quite the right piece for the puzzle at the time. And times change, so here I am. DJC: What kinds of things can you do as an artist to bring about nuance and variety to a show and your role which is so well-known? AF: I am known for originating parts, so to play a character that has been done so often is a challenge. It’s hard for me to fit into a mold because if my onstage actions don’t make sense to me, they won’t make sense to the audience, no matter how cleverly written the show is. I have to discover every single emotional moment on the stage and then somehow make it fit into the preconceived big picture. I try not to think about other people’s interpretations of the character because it just isn’t germane to this production at this time. DJC: Considering what the grind is like in a touring production, what is your process to go about keeping the show and character fresh for yourself? AF: “Wicked” is incredibly important to our audiences. It’s either the first time they have seen it, in which case we can create theatre fans for life, or they are passionate repeaters for whom our show resonates on a deep level. I have spoken with fans who have seen the show over thirty times, and the sparkle in their eye when they talk about it makes my heart glad. When theatre speaks to an audience on such an intense level, it reminds me very much of why I do what I do. So be they newbies or repeaters,we as a company owe it to the entire audience to give a hundred percent every single performance. DJC: Has singing a contralto part such as Madame Morrible been a challenge? What have you found to be some of your biggest challenges singing Stephen Schwartz music and lyrics? AF: As I said before, I do love Stephen’s music and lyrics, but Morrible’s track sings very very little. The contralto is no problem. That range is easy for me. I have adopted a unique gravelly voice for my Madame that can cause a bit of stress in a dry climate, but humidifiers are all over the place, so it works out. DJC: “Wicked” is returning to the Bay Area, where it had its pre-Broadway tryout in 2003, and a popular open-ended run which closed in 2010, the last Broadway show to open-end here. Do you have any special moments performing in the Bay Area throughout your career? AF: I am a Bay Area virgin, show-wise. I am really looking forward to performing “Wicked” in San Jose, and exploring the area. It’s my penultimate tour city, so I want to make the most of it!